The Jesuits had decided to expand their missions northward after Fernando Consag’s sea voyage in 1746 when he proved (as others before) that California was not an island. Yet nearly 20 years later, that point was still debated. 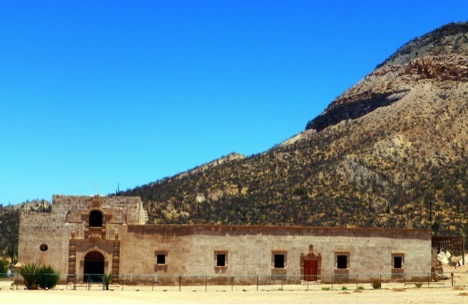 A chain of missions north from San Ignacio and around the Gulf of California to the missions in Sonora was started in 1752 with the founding of Mission Santa Gertrudis. The Jesuits were removed from the New World before the missions on both sides of the gulf could be connected. Two land expeditions by Padre Consag in 1751 and again in 1753, failed to find an acceptable site for the next mission north. Padre Jorge Retz of Santa Gertrudis began to send his neophytes out in search of possible mission sites. By 1758, Padre Retz learned of some hot springs called Adac by the Cochimí Indians. The water smelled of sulfur, but once it cooled it could be drunk without ill-effect. Adac was nearly a three-day journey from Santa Gertrudis, but relatively close to the fine natural harbor of Bahía de los Ángeles. Supplies and personal could be offloaded at that bay to support the new mission. The superior (or Padre Visitador) of the California Jesuits in 1758 was Fernando Consag, and he desired to establish a new mission at Adac. However, Consag died in 1759 and before seeing the project get underway. 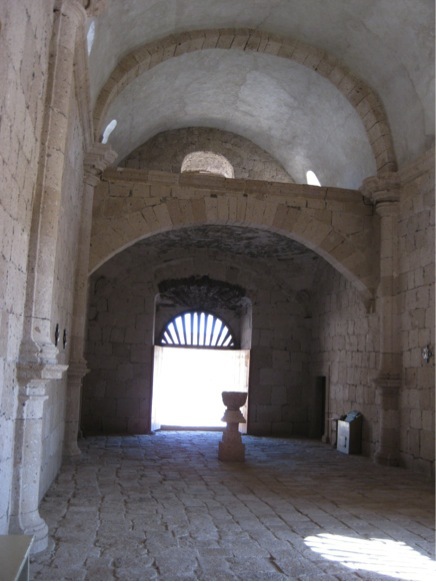 New mission funds were provided by an inheritance to the Jesuits from the Duchess of Gandía, Doña María de Borja (of the famous Borgia family in Spain). The inheritance was made in 1747 and delivered to California in 1756. In advance of the new mission’s founding, Padre Retz had a road built to Adac, and began construction there. The site became a visita (visiting station) of Santa Gertrudis on August 27, 1759. Padre José Rotea was chosen to be the new priest in charge, but when Padre Consag died, Rotea filled the vacancy created at San Ignacio. Padre Retz continued working at Adac where he had built a church, living quarters, a warehouse, and a hospital. Corn was planted in a small field by the hot spring. Retz had also baptized 300 Cochimí Indians for the new center. Padre Wenceslao Linck arrived in California and spent a few months with Jorge Retz at Santa Gertrudis learning the Cochimí language. Linck then rode north and arrived at his new post on Sept. 1, 1762. In honor of the benefactor, the new mission was named San Francisco de Borja for the saint and Duchess María’s ancestor. 142 addition baptisms were added during the mission’s first month of service. Supplies were shipped from Loreto to Bahía de los Ángeles where a large Cochimí ranchería (Indian village) was located. The natives were able to provide overland transport to San Borja, a half-day’s journey away. The first snow observed in California by Europeans was witnessed in December, 1763 at Las Cabras. This was about 14 miles south of San Borja and over 4,200 feet in elevation and is where the mission’s cattle were brought to graze. By 1764 the mission’s neophyte population exceeded 1,000. Padre Linck got assistance with the arrival of Padre Victoriano Arnés who came to train under Linck and learn the Cochimí dialect. This training was also required in advance of Arnés establishing the next mission to the north. The population of Mission San Borja swelled to 1,700 neophytes in 1766. Another Jesuit, Padre Juan José Diez arrived to assist Linck and Arnés. The neophytes could not all stay at San Borja as there was not enough food production there to sustain such a population. About 30-40 Indian families could live at the mission itself and others would come from their rancherías on rotation for instruction. The mission visitas or rancherías of Los Ángeles and Guadalupe were on the gulf coast; San Ignacio (San Ignacito today) and El Rosario (Rosarito today) were to the west; Santa Ana, San Miguel and San Régis were to the south, and one more called San Juan was included in a 1772 report. 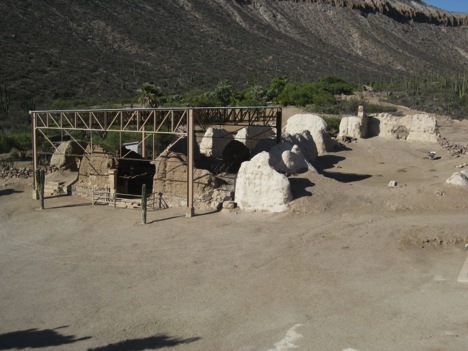 Further south is the canyon and ranch of El Paraiso, and it was listed as a mission farm. Nine miles southeast of San Borja is the abandoned adobe ranch house of San Gregorio. 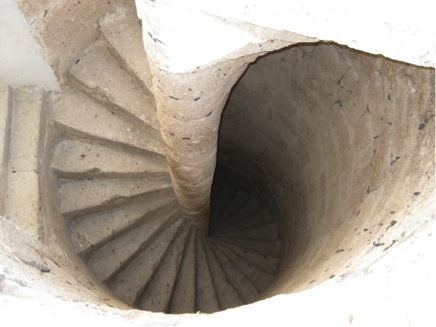 It is built on large cut stones, seemingly indicative of mission-era construction. Linck made two major expeditions out from San Borja in search of new converts. One was in 1765 to the island of Angel de la Guarda in the Gulf of California where fires had been seen on the island and reported to Linck. Using the mission’s launch they reached the island but after considerable exploration found no trace of human activity or sources of fresh water. The second expedition would take the Jesuit far north to pine covered mountains and within sight of the Colorado River Delta. It began on February 20, 1766 with 13 soldiers and several Indians. For almost two months Padre Linck explored up the center of the peninsula. Linck’s discoveries included a future mission site, called Velicatá by the Indians. The Franciscan Order replaced the Jesuits in 1768 and operated the California peninsula missions until mid-1773 when they divided California mission duties with the Dominican Order. Padre Fermín Francisco de Lasuén was the Franciscan priest stationed at San Borja. In 1773 he reported San Borja as having a new adobe church measuring 91 feet by 22 feet, with a roof of palm leaves. The Mission San Borja Indian population had dropped to 1,000 that year, as they succumbed to diseases and lifestyle changes. The Dominicans operated and expanded the missions on the peninsula, now designated as Antigua (Old) California, and eventually named Baja (Lower) California. The Franciscans would operate in Nueva (New) California, which was all the Spanish claimed land north of the peninsula. Several Dominicans were stationed at San Borja from 1775 to 1816, not all are known. In 1801, construction was reported as being nearly completed on the large cut-stone church. Sadly, the Indian population had continued to drop and was below 400. No missionary letters or reports are known to exist after 1816. The Mexican war of independence ran from 1810 through 1821 and contact between California and Spain was minimal at best. The war and rapidly declining Indian population spelled an end to San Borja, and the other Spanish missions. 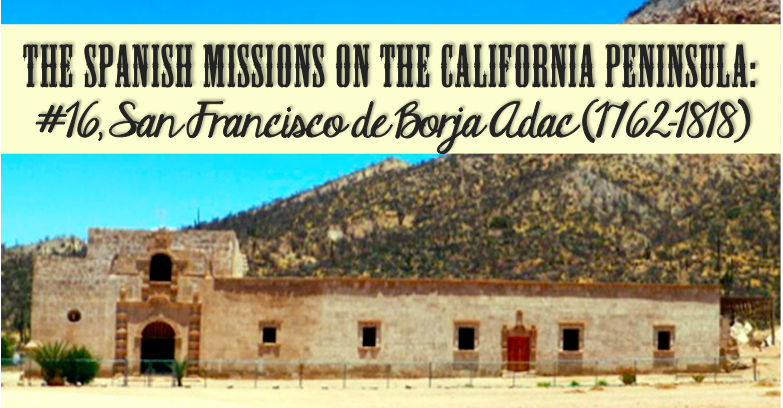 San Borja is the furthest north stone mission church on the California peninsula. The graded dirt road is 22 miles long from both the Bahia de los Ángeles highway, and from Highway 1, at Rosarito. Best driven in an SUV or truck, the sight of this Spanish church in the center of Baja California is well worth the effort. Exterior by Chris Glass in 2013. Interior by David Kier in 2009. 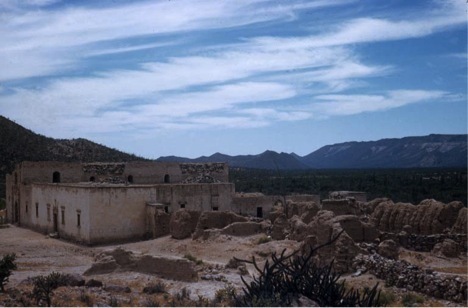 Protected adobe ruins by David Kier in 2009. 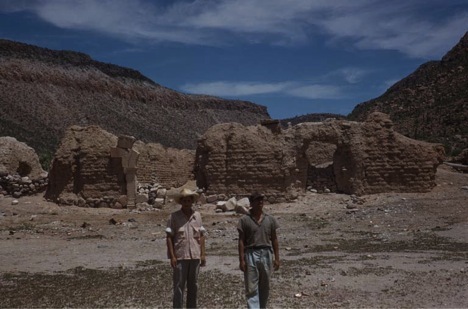 Adobe ruins in 1954 by Howard Gulick. Adobe ruins in 1952 by Howard Gulick. David Kier is co-author of ‘The Old Missions of Baja & Alta California, 1697-1834’. The book is available for purchase HERE or at the DBTC offices (call 800-727-2252). I visited here in June and thought it was beautiful. The stone church is magnificent and unlike the adobe churches I’m used to in Alta California missions. I’d like to read your book.